Although this website is a self-help website, and we do not usually comment on freedom of speech or political issues, there comes a time when we cannot allow ourselves to stay on the sidelines --- silent. There is now a case before the US Supreme Court that I think every person who loves freedom should watch closely. The case before our Highest Court concerns whether the father of a dead Marine should win his lawsuit against a [so called ] fundamentalist church group that picketed his son's funeral. The father alleged invasion of privacy, intentional infliction of emotional distress and civil conspiracy in his suit. His son died in Iraq in 2006, and members of the Westboro Baptist Church protested the funeral to make their point that U.S. deaths in Afghanistan and Iraq are punishment for Americans' immorality, including tolerance of homosexuality and abortion. The issues, from my point of view, are the hurtful ( & Un-Christian) tactics employed by these protesters. They assert their "right to speak their mind" while deliberately disregarding the rights of people --who just want to bury their loved one in peace -- with dignity & respect. Case in point-- the cruel, hurtful signs carried by the protesters. 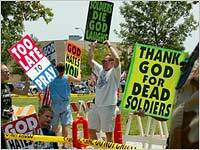 The Kansas congregation held signs outside the funeral reading "Thank God for Dead Soldiers" and "God Hates You". The right to free speech, along with all the other rights which are guaranteed by our Bill of Rights, our Constitution, and our Laws are "rights"
--that have been paid for by the blood of our past and present soldiers. As Americans we are extremely proud and protective when it comes to our fundamental rights -- and we will readily assert these rights. along with these "rights" we also have a tremendous responsibility -- both to each other, and to the rest of the world. Just because we have the "right to free speech" --does not mean that as a result of our right -- we can step on the rights of others. -And if we profess to be Christians - to act from a position of love & forgiveness --and not for a position of hate & scorn. These home grown terrorists -hiding under the "Bill of Rights", are more dangerous than the external terrorist groups looking to undermine our way of life. These home grown groups demand their rights -- but neglect their responsibilities & the rights of other. These groups demand and fight for their right to say and do hateful things, while trampling on the rights of others. -This is the new Taliban -- The American Taliban. -very soon they would be chopping hands off. -having public executions of people they deem undesirable. -you are also responsible and accountable" for your words and actions. Your opinion is important.What do you think? The Supreme Court ruled on March 2, 2011 that the free speech provisions of the U.S. Constitution protect fundamentalist church members of the Westboro Baptist Church. The court voted 8-1 in favor of the Westboro Baptist Church. Chief Justice John Roberts wrote the opinion for the court. Chief Justice Roberts said the Constitution's First Amendment shields the funeral protesters, noting that they obeyed police directions and were 1,000 feet (300 meters) from the church. ...The speech was indeed planned to coincide with Matthew Snyder’s funeral, but did not itself disrupt that funeral, and Westboro’s choice to conduct its picketing at that time and place did not alter the nature of its speech. It can stir people to action, move them to tears of both joy and sorrow, and—as it did here—inflict great pain. On the facts before us, we cannot react to that pain by punishing the speaker. As a Nation we have chosen a different course—to protect even hurtful speech on public issues to ensure that we do not stifle public debate. That choice requires that we shield Westboro from tort liability for its picketing in this case. Petitioner Albert Snyder is not a public figure. He is simply a parent whose son, Marine Lance Corporal Matthew Snyder, was killed in Iraq. Mr. Snyder wanted what is surely the right of any parent who experiences such an incalculable loss: to bury his son in peace. But respondents, members of the Westboro Baptist Church, deprived him of that elementary right. They first issued a press release and thus turned Matthew’s funeral into a tumultuous media event. They then appeared at the church, approached as closely as they could without trespassing, and launched a malevolent verbal attack on Matthew and his family at a time of acute emotional vulnerability. The Court now holds that the First Amendment protected respondents’ right to brutalize Mr. Snyder. I cannot agree. strong opinions on certain moral, religious, and political issues, and the First Amendment ensures that they have almost limitless opportunities to express their views. they may post messages on the Internet and send out e-mails. And they may express their views in terms that are “uninhibited,” “vehement,” and “caustic.” New York Times Co. v. Sullivan, 376 U. S. 254, 270 (1964). In order to have a society in which public issues can be openly and vigorously debated, it is not necessary to allow the brutalization of innocent victims like petitioner. In my opinion, Justice Alito is the only Justice who has it right. -- He used his knowledge, common sense and wisdom to arrive at a reasonable conclusion. Why do our Courts continue to expand the rights of criminals, and extremist hate groups?? The Supreme Court struck down a federal law aimed at banning videos that show graphic violence against animals, saying it violates the right to free speech. Chief Justice John Roberts, writing for the majority, said the law goes too far, suggesting that a measure limited to crush videos might be valid. The only Justice to dissent was , Justice Samuel Alito.